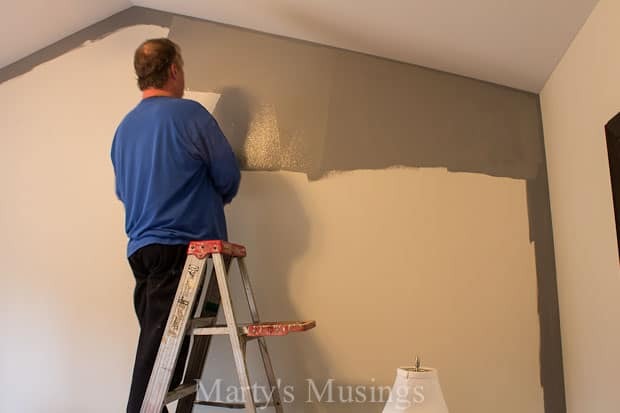 Our prompt as a Behr DIY Expert this month was fresh starts for the New Year, and you’ll love this tutorial from my DIY hubby with tips on painting an accent wall! They have been married for a little over two years and bought their first home in June 2012. 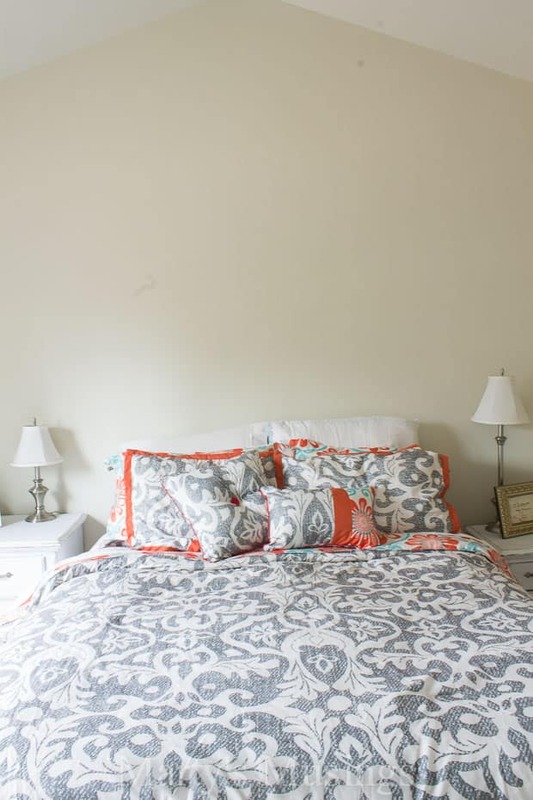 Rachel had purchased this adorable bedding set and wanted to add an accent wall to their master bedroom. Here comes daddy to the rescue! It’s pretty sweet having a painting contractor for a dad and one willing to bring the whole family for a few hours of family bonding! Here’s dad with the details! 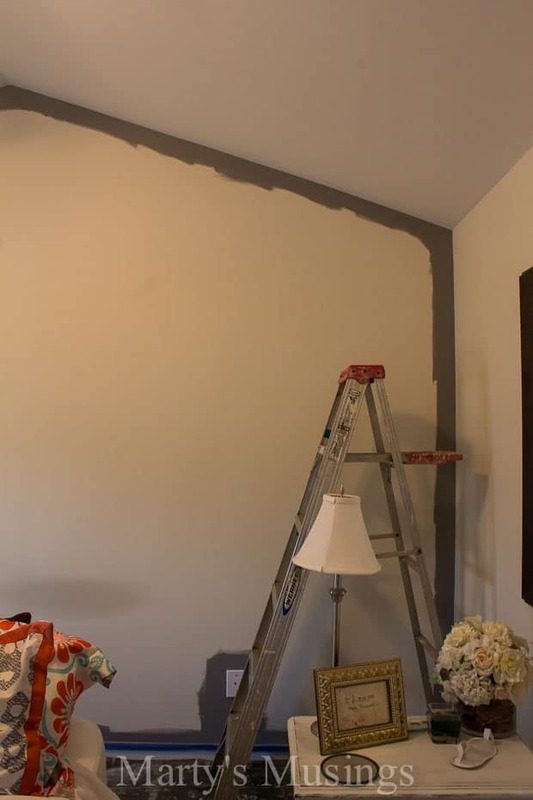 From Tim: I think that accent walls are one of the more enjoyable projects to knock out. 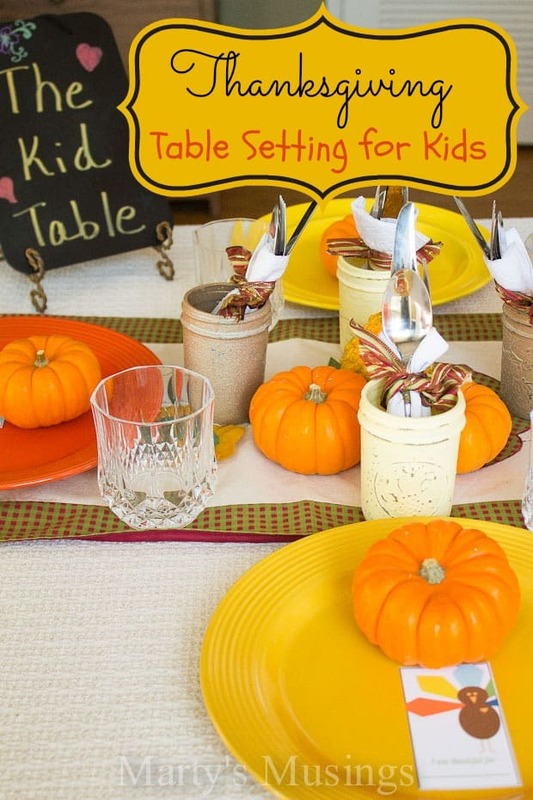 They can add so much flair to a room and are a low-cost change with a big pay-off. However, because more dramatic colors are often used, the painter needs to bring the “A-game”! 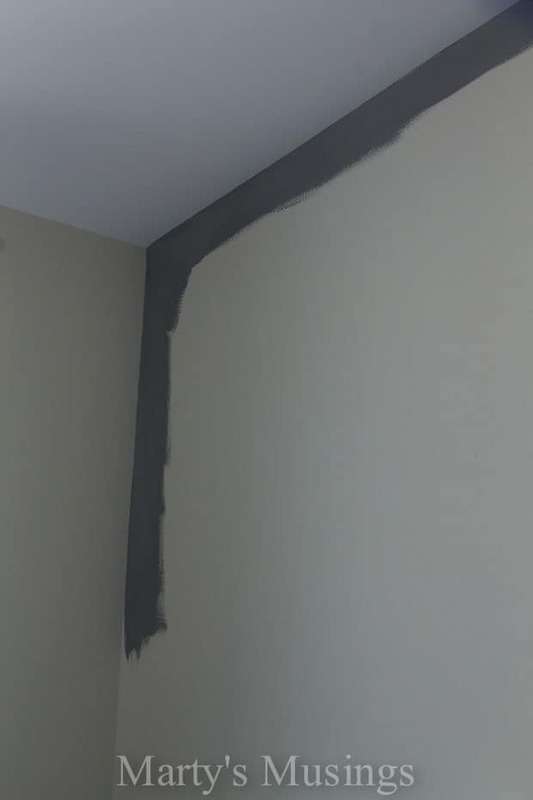 Lines need to be nice and crisp and no ceiling bumps! I have been a professional painting contractor for many years, so I rarely use tape. It is certainly an option if you are not comfortable getting straight lines, but be aware that using painter’s tape is NOT a guarantee that your lines will be clean and without flaw. Most people almost always get bleed-through under the tape, so if you use it, do so as a safety net and not as a crutch. That means try and allow only the smallest amount of paint on the tape. 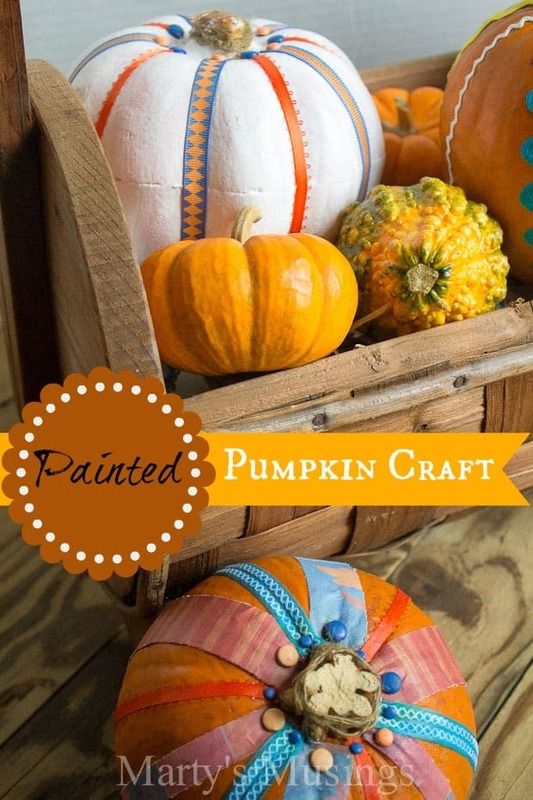 It’s also a good idea to press the tape into the corner with your painter’s tool or a putty knife. This will work to reduce the bleed-through. I will cut in a brush width first all the way around the wall, working from top to bottom. A vaulted wall, like this one, is a bit tricky but nothing at all to panic about. Since I knew this color would require two coats (even though the BEHR Ultra Premium Plus primer/paint combo gave me AMAZING coverage after one pass), I went a bit wider with the cut-in. With the second coat, I actually reduced the width by 50%. This just saves a bit of time and paint. After the brush work is done, we move to the speedy part with the roller. Don’t worry about the color difference! These dark colors go on light and dry down darker. It is VERY important to use a shed-resistant roller cover with the BEHR paint. You will get a much cleaner finish without the hair remnants from a cheap cover. Spend the extra money for a good roller cover. My weapon of choice is a 9″ cover with a 3/8″ or 1/2″ nap. So, just start at the top and roll as close as you are comfortable doing. I can usually get within a 1/2″ of the unpainted wall. 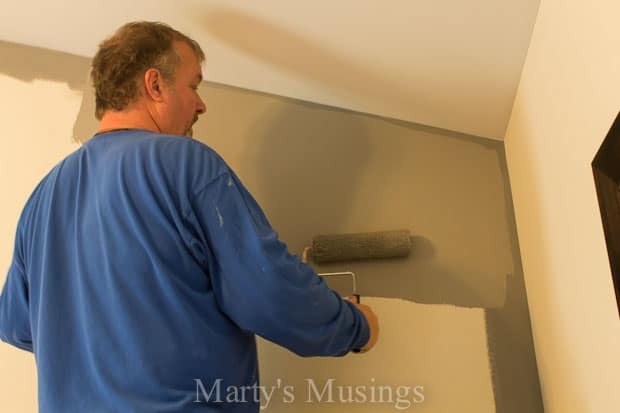 Maintaining a “wet edge” is not so critical on the first coat; that just means always rolling fast enough so you’re never working into a dry spot (except where you brushed). With big walls that can be very tough, especially in stairwells. But a second coat well-executed will solve most problems. I will work this particular wall all the way across down to the same point, then move down all the way across, continuing to the baseboard. You’ve got to really run with this with the second coat, but, again, not so critical the first time around. You can even use an extension pole if you want, but watch for inconsistent pressure that can leave lines or “ropes” of too much paint. A good practice is to lightly drag the roller in vertical passes across the entire section you are currently working to give you a nice, consistent application. And this is the finished accent wall! Total time for this project? How about less than two hours, beginning to end! 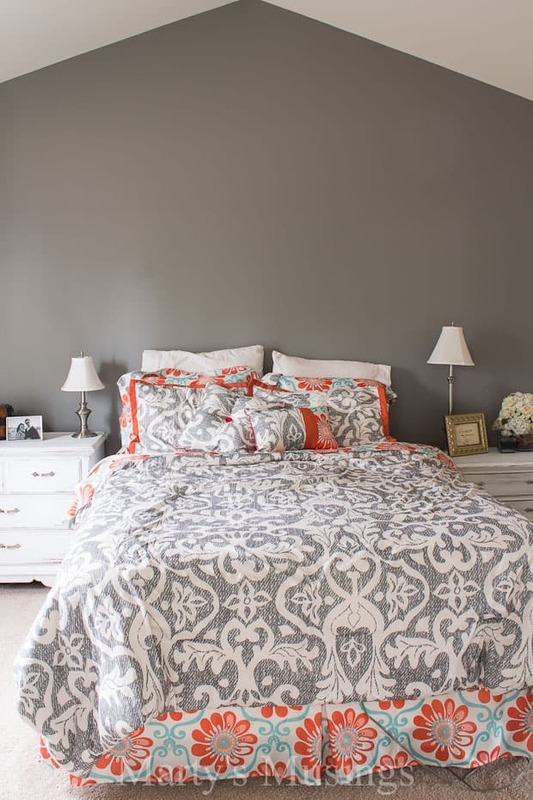 I love Rachel’s room so much I’m using gray and coral as a starting point for my own bedroom makeover! And because she knows me so well she gave me her previous comforter for Christmas and I was ecstatic! 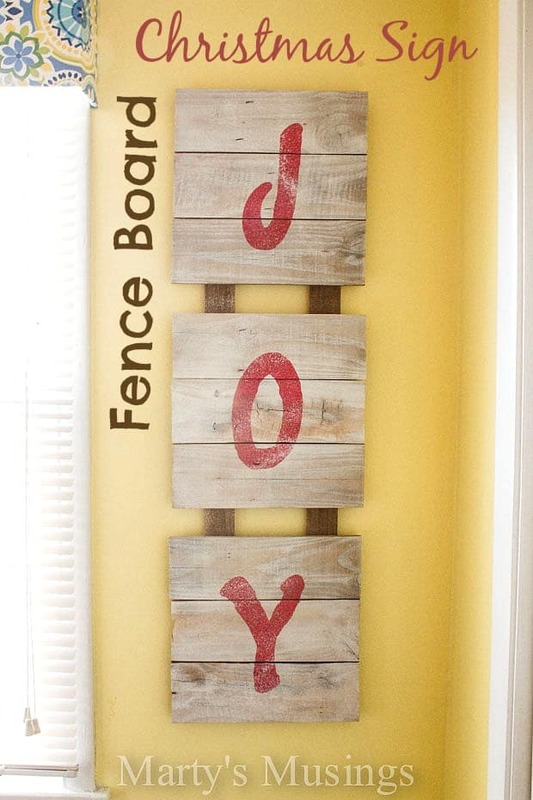 There’s nothing better than a makeover and repurpose project! 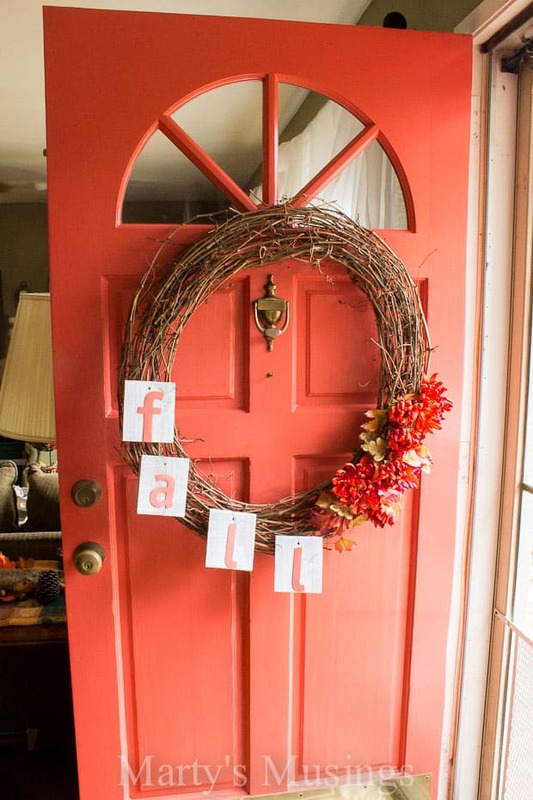 Where can you use paint to make a fresh start in your home? Behr and I would love to see your projects. Share them here in the comments or tweet them @BEHRPaint. It looks so awesome! I saw it on Rachel’s FB and couldn’t wait to see the post! 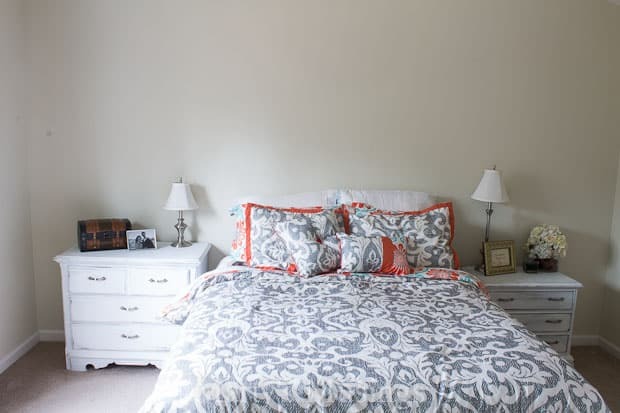 I love the whole look of the room–so comfy! Thanks, Hayley! Go check out the headboard she and Donny made, too (on her fb page). How’s your blog coming along? 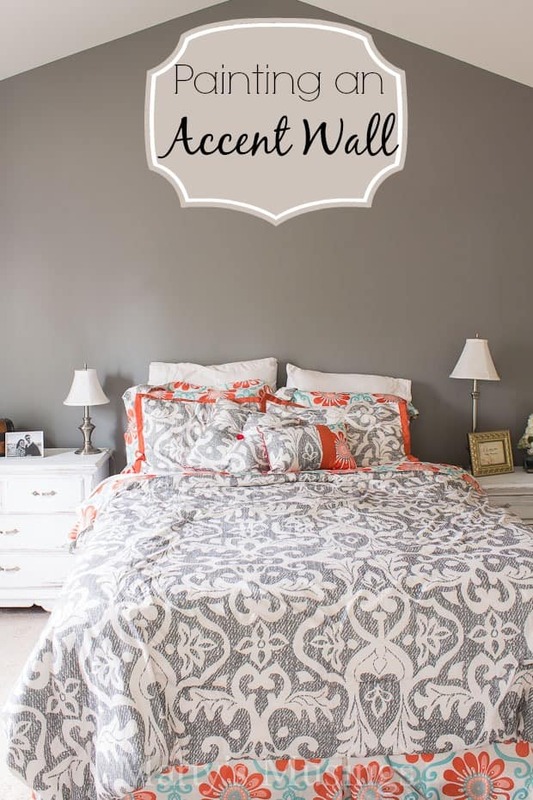 What a difference the accent wall makes! The tutorial and tips were terrific. I’m loving Rachel’s color combo and can’t wait to see how you use it in your own bedroom, Marty. Thanks to your hubby for the painting lesson! My husband taught me how to cut in without tape and learning how to do this saves a lot of time. I love the color of gray! 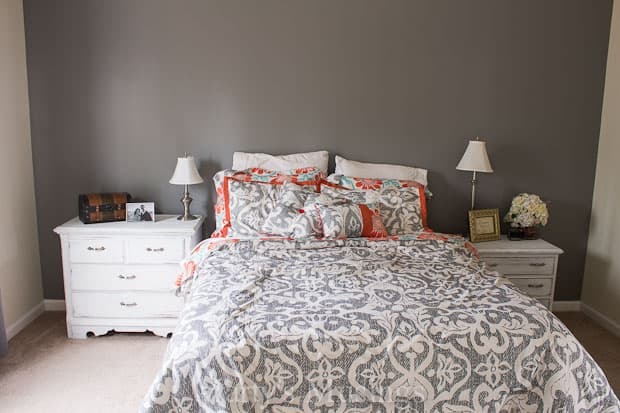 I am starting to decorate a guest bedroom and was thinking of gray, now seeing this has convinced me to do it! Thanks For sharing Marty! wet edge? working into a dry spot? except where you brushed? please explain. also I don’t understand “You’ve got to really run with this with the second coat” ???? and last: “A good practice is to lightly drag the roller in vertical passes across the entire section you are currently working to give you a nice, consistent application. ” what are vertical passes? shouldn’t you always paint vertically? HOW DO YOU PAINT INTO INTO THE CORNERS? IS IT WITH A PAINT BRUSH? Where did you get your bed set? It’s beautiful and exactly what I have been looking for! Hi, Annika. I’m really sorry but my daughter got the bed set on a local groupon. You might be able to just search their site for bedding sets and see what pops up. Let me know if it does because I’ve gotten many requests for it! Have a great day! Please share the name of the gray color used! I love it!! Finding the right color gray is very frustrating. I’ve gone through 6 samples already with no luck. Thanks. Hi, Diana. I added the name of the paint to the post but it’s BEHR Premium Plus Eggshell Finish, 780F-5 Anonymous. Hope it works for you! I added the color to the post itself but it’s BEHR Premium Plus Eggshell Finish 780F-5 Anonymous. Hope it works for you! I too am struggling to find the right gray, could you please provide the name of the shade used? It would be ever so helpful!!! Hi, Teresa. Sorry it took me a while to respond. My blog was messed up for several days. I added the color to the post itself but it’s BEHR Premium Plus Eggshell Finish 780F-5 Anonymous. Hope it works for you! I know you said the bedding came from groupon, but was there a company name? I love it! 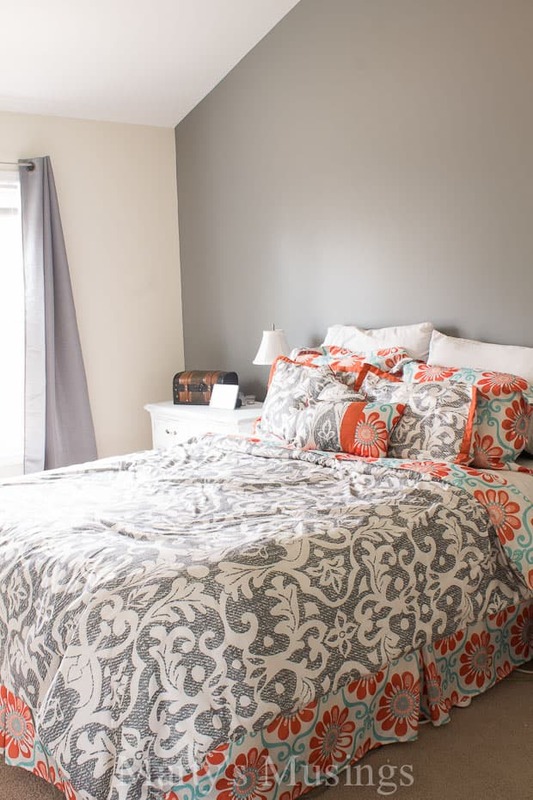 The accent paint wall really makes the bedding pop! I love the color. That wall looks great! And gray and coral work so well together! Where can I find that bedding? It’s beautiful & would be perfect in our newly painted master. I was wondering what the name of the color on the opposite walls were, I’m trying to find a contrast color for the other walls and I like these colors a lot! Thanks you! Hi, Sara. I don’t know the exact color. The previous owners didn’t leave any paint for matching. My husband said his guess would be antique white from Sherwin Williams but that’s just a guess. Hope that helps!